Anti-kinking - Nylon air lines (sometimes called pigtails or pig tail lines) can kink and cause dangerous air blockage. 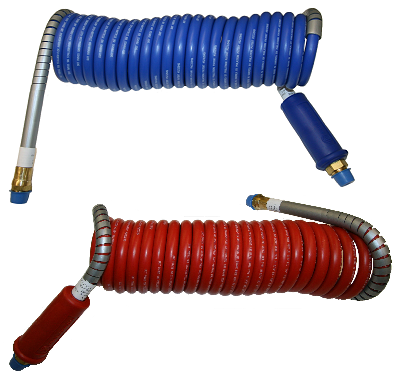 Stallion-Flex coiled air brake hoses are resistant to kinking. Super Durability - Air brake coils constantly flex due to truck vibrations and turning. When subjected to a high speed flexing test, nylon lines from three different companies failed at 3060 cycles, 8460 cycles and 51800 cycles. When subjected to the same test, Stallion-Flex II air lines did not fail after over one million cycles. Resistant to brake lag - Stallion Power Air Lines HD trucking air hose assemblies have been tested to provide 11% to 13.7% faster braking than nylon brake lines. DOT Certified - Stallion Power Air Lines air lines are certified to meet all the requirements of the U.S. Department of Transportation. Tighter Coil Memory - Nylon lines have space between each coil. Stallion-Flex air line’s coil memory is so tight that there is no space between each coil. This eliminates sagging and entanglement so you avoid citations. Tough Jackets - Stallion Power Air Lines are resistant to chemicals, oil, sunlight, water and extreme weather conditions. Superior Construct - Stallion Power Air Lines are twice as thick as the nylon brands. Warranty - Stallion Power Air Lines have a three-year warranty against cracking, kinking, excessive sagging or other significant physical damage resulting from temperature extremes, exposure to oils and chemicals, or flexing fatigue. Bottom Line - Buying Stallion Power Air Lines will save you time and money! Stallion Flex Air Lines are the BEST VALUE in the industry: FREE Glad Hand Grips! 2 Times Greater Hose Thickness! 3-Year Warranty! CHEAPER ISN’T THE CHEAPEST! TAKE A CLOSER LOOK, AND BUY STALLION TRUCKING COILED AIR LINES FOR MAXIMUM PERFORMANCE.